Dieng quietly put together a strong Year three performance as a supporting actor to Minnesota's rendition of Kat's. Dieng's development over the past three seasons is a tribute to his professionalism. The high value he places on responsibility likely played a key role in his ability to progress while the organizational direction was still unclear. Those confident/conservative qualities instill a resilience in Dieng that help to block out noise. But those same qualities also can make small changes take longer to internalize as well. The coaching staff will have to be invested in Dieng's growth potential in order to capitalize on the benefits of the team's newfound stability. Dieng is in a good position to take another developmental leap forward. His profile alludes to a strong potential for chemistry with Karl-Anthony Towns from a personality standpoint. Building that relationship as part of the foundation of the team's defensive culture should tickle Dieng's strongest qualities and lock him into reaching the benchmarks set before him. Coach Thibodeau's affinity for gritty defenders also strengthens this tandem's potential. Both players possess the length to defend the interior, while still having the mobility to switch on the perimeter. Dieng's touch from the free throw line (83%) and degree-of-difficulty finishes in the post also show his potential to join KAT as a three-point threat, but his technique needs some polishing up - particularly when operating on the perimeter. There is still plenty of room for growth here. Players with Dieng's traits typically take longer to internalize changes to familiar habits. Couple those traits with three seasons of transition, and you have a confluence of factors that can impede his rate of development. The order of organizational priorities may favor more individual attention to Towns, Wiggins, and Dunn; but there is a high R.O.I. to be garnered from investing in Dieng as well. Establishing himself as one of the best centers in the country, Gorgui Dieng played a key role in guiding Louisville to a National Championship as a junior with his inspired play despite breaking his wrist just five games into the season. Less than four years removed from being named MVP of the 2009 Basketball Without Borders event in South Africa and subsequently enrolling in prep school in the United States, the once raw, skinny big man has grown into a very mature player with his combination of length, defensive ability, and unique, albeit still fairly unpolished, offensive skillset. Dieng's intrigue as an NBA prospect starts with his prototypical size and length for the center position. Standing 6'11 with a 7'4+ wingspan, he's added nearly 50 pounds to his frame since arriving in the USA, and although he could still stand to pack on more muscle to both his upper and lower body, he certainly passes the look test at this point more easily than he did as recently as a year ago. On top of his sheer size, Dieng is also a solid athlete for a near 7-footer, possessing good quickness and leaping ability to go along with a strong motor. His mobility is noticeable in his rebounding ability, but even more so on the defensive end, where he did a tremendous job last season protecting the rim behind Louisville's aggressive perimeter players in Rick Pitino's zone and when defending one-on-one en route to being named Big East Defensive Player of the Year. The anchor of the #1 ranked defense in the country, Dieng averaged an impressive 3.2 blocks per-40 minutes pace adjusted as a junior. While he doesn't rank as well nationally as he did as a sophomore when he blocked 3.8 shots per-40 pace adjusted, he's a very capable weakside shot-blocker with excellent timing who has learned to patrol the paint without fouling or goaltending as much as he did in the past. As a one-on-one defender, Dieng shows impressive intensity and held his own at and away from the rim at the college level. He still bites on fakes and gets beat on quick, powerful post moves on occasion, but does a very good job of battling on the block on the whole. He also had some impressive moments defending the perimeter this season as well, doing a good job of getting low and moving his feet when switched onto a guard. Moving forward, Dieng would benefit from getting stronger and more disciplined to help him make the transition to defending the bigger, more skilled post scorers he'll encounter in the NBA, but he's clearly on the right track. On the offensive end, Dieng's role as a junior remained largely unchanged from the one he played during the majority of his sophomore year, revolving primarily around his score to play off the penetration of his teammates, create opportunities for himself by crashing the boards, and make the most of a few touches in the post each game. On paper, Dieng's scoring numbers climbed only marginally this year. His points per-40 pace adjusted rate improved from 10.8 to 12.3 and his points per-possession jumped from 0.893 to 0.927 according to Synergy Sports Technology. The 2013 All-Big East 1st Team selection did the majority of his damage in the immediate vicinity of the rim this season, with most of his scoring opportunities created by his teammates. After shooting 59% around the basket last season, Dieng's conversion rate in close jumped to 66% this season as he looked a bit more under control in traffic than he did a year ago. Able to finish above the rim with a dunk or through contact with his improved touch and frame, Dieng is a big, active target working off the ball and in the two-man game. With his back to the basket, Dieng took a step back in terms of productivity this season, converting just 28% of his attempts from the post, rarely getting the rolls or deep position that helped him shoot 48% last year. Lacking much in the way of counter moves and seldom using his left hand to score after breaking his left wrist, Dieng's footwork looked a bit rangier on some of his post moves, but he did not appear comfortable improvising one-on-one. He flashes deft touch on his right-handed hook shot and will drop in a turnaround jumper from time to time, but until Dieng can become less predictable and yield more consistent results, he'll continue to face questions about his ability to contribute offensively on the block at the next level. Where Dieng did show some promise offensively last season was as a midrange threat with his spot-up jump shot. Knocking down 15 of the 23 jumpers he attempted over the last 15 games of the season and 50% of his 42 attempts overall, Dieng shoots the ball with his high release point and found fairly consistent results when he could catch and shoot in rhythm. Considering the sample size and Dieng's 65% shooting from the foul line, it remains to be seen how prolific Dieng can be away from the basket immediately, but the flashes he showed leave a lot of room for optimism. Perhaps Dieng's most unique attribute as a player is his ability to use his size to his advantage and make sound decisions as a passer. For a prolific shot blocker, Dieng's ability to distribute the ball places himin rare company among NCAA shot-blocking centers from the BCS in the last decade with a positive assist to turnover. Averaging 2.5 assists per-40 minutes pace adjusted, Dieng' is not an unprecedented passer for a big man, but he possesses terrific vision, does a good job delivering crisp passes in close, and had some exceptional stretches picking apart zone defenses from the high post. Even putting the ball on the floor and attacking the rim in a straight line from time to time, Dieng will flash some talents with the ball that most defensive-oriented centers at the college level lack. Already 23 years old, Dieng is currently the second oldest player slated to be picked in our 2013 mock draft. Though that limits his perceived upside, his steady improvement in each of his seasons at the college level leaves some room for optimism looking ahead. Considering his size, athleticism, defensive ability, and effort level, the Senegal-born center is one of easier prospects to pencil into an immediate role among those slated to be available in the middle of the first round in this draft. 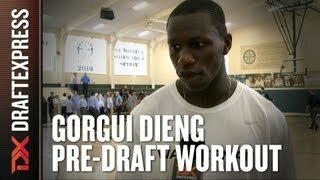 Possessing many of the tools necessary to find early minutes as a backup center, it will be interesting to see how teams value Dieng's readiness but lack of elite upside as we head towards the draft as well as where his work ethic takes him as he prepares for the draft in the coming months. After a promising freshman season where he excelled in a limited role, Gorgui Dieng clearly took his game to the next level as a sophomore, more than doubling his minutes per game while developing into one of Louisville's most important players. Dieng's physical attributes standing 6-10 with a reported 7-6 wingspan-- remain his strongest selling point, and he's an even more attractive prospect from that perspective than he was the last time we profiled him. Dieng has significantly filled out his frame and added strength since he stepped foot on campus, and reportedly made even more gains this summer based on the way he looked at the Adidas Nations in August. While Dieng's increased mass will certainly help him better contest physically inside on both ends of the floor, it's also been relieving that he hasn't sacrificed any athleticism or mobility for it, still being all the athlete he was two years ago. On the offensive end, Dieng's game is still a work in progress, and some of his numbers actually took a step back this season in response to his larger workload. His increased touches and scoring opportunities led to his field-goal percentage dropping significantly from 61.8% to 52.5%, and his issues with touch and at time even his hands have become more apparent around the basket. Dieng is at his best offensively in the pick-and-roll game, where his great size and excellent mobility often allow him to get open with a head of steam going to the basket. He finishes with authority and is continually improving here, something that will certainly be attractive projecting to the highly pick-and-roll oriented NBA. Dieng shows more troubles in other situations, specifically finishing on cuts in crowded areas, where he doesn't always deal with increased defensive attention well. He doesn't have much ability to put the ball on the floor and can get into trouble bringing the ball down low before going up for a finish, which can lead him into compromised positions where he isn't capable of putting up consistently high efficiency shots. Still, by virtue of his tools, he remains a good finisher overall, capable of scoring with finesse or power around the basket, but has significantly more potential if he cleans up his rough edges. Dieng's back-to-the-basket game is another work in progress, as he shows flashes of effective hook shots, turnaround jumpers, and lay-ups, but is still inconsistent with his touch, specifically when he gets farther away from the basket. His mid-range jumper is less impressive, as he made just 11 of 31 attempts on the season according to Synergy Sports Technology, but he did see a noticeable bump in his FT% from 53.8% to 67.6%, which could translate to live action this season. While Dieng's scoring abilities are coming along slowly in most areas, he actually has a surprisingly good feel for the game for a player with his background at his stage of development, and he consistently finds ways to contribute offensively when he isn't putting the ball in the basket. Constantly moving off the ball, especially when shots go up, Dieng does a good job moving in the offense and getting open while being a huge asset on the offensive glass. Dieng uses his size, mobility, and incredible length very well to track down offensive rebounds, showing a very strong nose for the ball. He also has developed into a subtly good passer in the flow of the offense, serving as a useful cog with the ball, especially from the high post. The defensive end is where Dieng really makes his impact, however, and where he made significant strides as a sophomore. While Dieng's blocks per pace adjusted 40 minutes fell this past season, so too did his personal fouls, allowing him to play a very impressive 32.8 minutes per game for a defensive-oriented big. His overall defense didn't take a hit either, as he actually improved in most areas and allowed him to anchor the #1 ranked defense in the country according to kenpom.com. Dieng was already a threatening team defender as a freshman by virtue of his shot-blocking prowess, but he really took his man-to-man defense to the next level as a sophomore, both in the post and on the perimeter. Down low, Dieng's added strength and improved fundamental base allowed him to more easily stay in front of and contest opponents, though he still relies heavily on his outstretched length to contest shots. His improvements on the perimeter were perhaps even more decisive, specifically in the pick-and-roll game where he has an incredibly unique combination of tools. Dieng's combination of mobility, size, length, and change-of-direction ability make him a menace shutting down pick-and-rolls, specifically with his ability to block shots from behind on drives in the lane. Looking forward, Dieng clearly made some excellent overall strides as a sophomore, but the drop-off in his scoring efficiency around the basket is concerning. His combination of defense, rebounding, and pick-and-roll prowess already make him an intriguing prospect from an NBA perspective, though he can certainly take his game to the next level by continuing to get stronger, developing a reliable mid-range jumper, or becoming a more consistent finisher around the basket, all of which is well within his reach. Turning 23 this January, Dieng is significantly older than most of the juniors in his class, which may increase the pressure on him to leave school a year early if he has a strong year. It will be interesting to see how much more he's able to improve this season, as it's not out of the question that his learning curve is much different than most Americans his age considering his unique background, having only arrived in the US in 2009 weighing 187 pounds. After a freshman season playing only 15.6 minutes per game, Louisville's Gorgui Dieng should see a larger role as a sophomore, thanks in part to the early departure of Terrence Jennings, who declared for the 2011 NBA Draft but went undrafted. Dieng, a former top 50 recruit who spent a year at Huntington Prep after coming to the United States from Senegal, showed glimpses last season of why he's an intriguing NBA prospect, and it will be interesting to see what type of development he's made since then with his body and skill level. Dieng stands out immediately as a freakish physical specimen with his size at 6'10 and his incredible length, with what is rumored to be a 7'4 wingspan. On top of that, he has great mobility for a player his size and is able to cover a ton of ground in a hurry with his long, rangy strides. He's added some strength to his thin frame since arriving at Louisville, but he'll need to continue to work on his body in order to compete with the stronger, bulkier players he'll face in the paint. Offensively, Dieng is still a bit raw in terms of his skill set, but he did show flashes of some skill with his back to the basket, as about 22% of his possessions last season came in the post. He has great length and a pretty soft touch be able to shoot up and over defenders and seems most comfortable turning to his left shoulder. His poor footwork and lack of strength and counter moves often gets him pushed out of position too far away from the basket, though, resulting in lower percentage shots fading away from the hoop. He gets another large portion of his touches off of cuts and offensive rebounds, utilizing his incredible length, but he also showed some promise as a pick-and-roll finisher. His excellent mobility and huge wingspan make him an easy target when he rolls hard to the basket, where he's able to finish effectively above the rim. Dieng also mixed in the occasional mid-range jump shot last season, but his stroke is still a work in progress, as evidenced by the poor 54% he shot from the foul line as a freshman. On the defensive end, Dieng has excellent potential thanks to his physical tools. He's a tremendous asset as a rim-protector in the back of the Louisville zone, able to block or alter most any shot in the basket area. His 4.8 blocks per forty minutes pace adjusted last season placed him in the top 10 of all players in our database. Going forward, Dieng will need to continue to add strength and improve his defensive awareness in order to maximize his talents and improve as a man to man defender. He got muscled out of position on the inside, fouled at a fairly high rate, and was just average defensive rebounder as a freshman. Although Dieng will turn 22 years old during his sophomore season, it appears he still has quite a bit of room to grow as he adds strength to his body and continues to develop his skill level and feel for the game. Players at 6'10 with his combination of mobility and length are highly coveted in today's NBA, so scouts will surely be keeping an eye on him during his time at Louisville.